I am impressed by the low resource usage of the 1.7 beta. With resource intensive tasks such as Tone Mapping, my 2012 MBP retina is not screaming at all compared to 1.6 release. I suppose moving a lot of the computation to GPU has contributed to this. Well done, Andy and team. 1.7 is shaping up nicely. Out of curiosity, what is an example use case for "New cube setup mode for grid"? I see its usefulness in Affinity Designer and I hoping I can be helped with use case for Photo. Hi @Andy Somerfield i'm so happy to find this anouncement. Was updated via @MEB twitter publication. Busy downloading the thing now and will report here asap. i'm more interested into what the inpainting and the flood selection tools can do now. I tried to find any info about locking the symmetrical "ruler/lines" . I´m constantly moving the line while painting close to that mirror edge - so to speak. Any hint will be much appreciated. Out of curiosity, what is an example use case for "New cube setup mode for grid"? Considering no isometric studio in Photo, I would estimate it is most likely for consistency and compatibility with the other programs, as you might open a file created in Designer that already has such a grid set up. You can start by viewing the Serif Affinity official Levels Adjustment Tutorial. There is also Affinity Photo Help document. You can search for "Levels Adjustment". The help file is very comprehensive. The upper two sliders and gamma slider haven't changed since the video was produced. The new lower two can be used to compress the range of tones in the channels of an image. 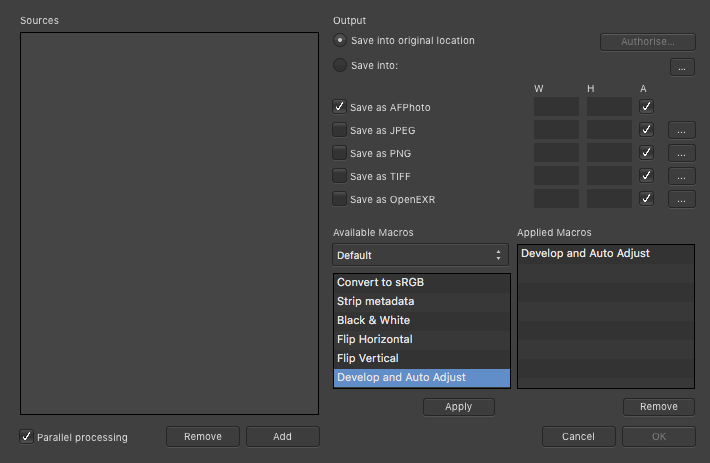 Watch the Histogram panel that is in the right hand Studio of AP as you move the sliders. - brushes are like in 1.6 macro-able (except the smudge and the colorchange with "clean/take always background" does not run, same in 1.6). And some other nice fixes. Thankyou! To GrahamMYC: try and see! I remark that the lower slider does a little bit the opposite, than the upper ones, but with a kind of gamma-shift????? However, i prefer curves instead levels! * Liquify Persona is now quite okay and few stuffs like twirl works a bit more naturally but still the speed of this (even when increased) looks a bit mechanic and should be made more natural, do not forget the thing is done with a Brush and we should feel it naturally going and not machine style. * brush selection tool also is far better than the previous beta did and this is really encouraging. * i've tried to drag and drop a layer/mask/filter etc. from one opened tab to another but nothing does. Please fix as it is a common way to operate in the same software. * Select a Mask then Click + drag and drop it to above or bottom layer doesn work (or maybe i don't know how to do that) i can simply Click - cmd/ctrl+c - select layer and cmd/ctrl+v. Please fix ! * Now the software itself loads faster and uses less resources but still i believe this can be pushed high or simply improved. * it is not yet possible to increase the size of icons in the layer section, please make it possible to switch between at least 3 size small-medium and large. it is helpful for those doing public demonstration or simply teaching or even doesn't not have good eyes anymore. * There should be (on the welcome screen) a tab or a section added (within "View samples" - "View tutorials" - "Connect") that we can slide/click to and just view our recent project.works; it is painful to go search for it the "File" Menu, bringing it forward, beautifully and nicely made is . * Possible to implement a Home Button that switch us back to the welcome screen where we can view recent project and just click to open it ? Okay ... this is too much and i hope i have not pushed things too far. BTW ... This Beta is great and i can imagine how impresive and lovely R1.7 will be. OCIO on a 16-bit integer file renders the entire image black. The built-in help document in version 1.7 has been updated to provide information about the two extra sliders you are talking about that. My version is 1.7.0..209. It does not yet include the updated help file. But that changed help file addresses 90% of my query and will be included at some stage. For professionals it will be 100% clear, but for hobbyiists like me, we are guessing as to whys and wherefores of remapping. No doubt a little practice will solve that. 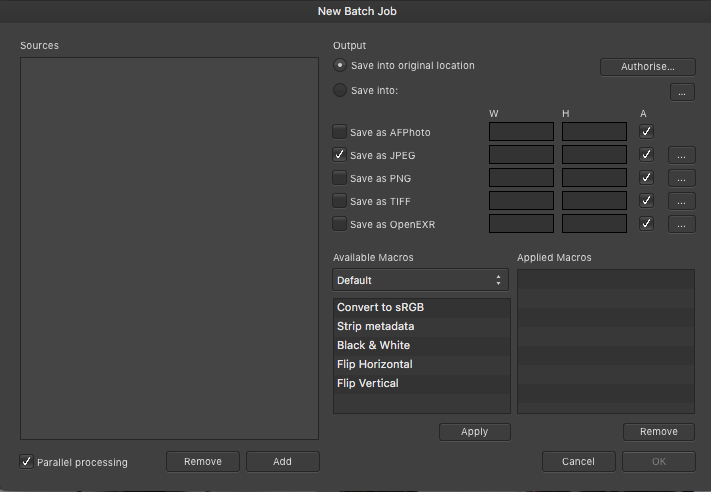 In the normal version of AP, I have the option to batch develop RAW images. In the Beta this disappeared? 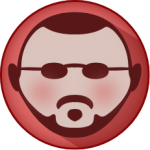 Have you installed your macros into the beta version? The beta and stable versions do not share user-provided settings, brushes, macros, etc. It's nothing standard in 1.6, so you must have added it. You'll need to look in your 1.6 Library panel to find it. "- Metadata is now dynamically synchronised with your document - so if you resize then export, the values will be correct." Does this mean that AP will now retain the previously-existing metadata in the document? For instance, I add XMP/IPTC and Mac system metadata (star ratings, etc.) to the TIFF files with a cataloging program (NeoFinder). That metadata is viewable in Preview and searchable with Spotlight. However, when I do any manipulation of the TIFF in AP then save it again (with the layers intact), all of the metadata that existed is erased. Gone. Does this change address that problem? EDITED TO ADD UPDATE: Finally got the beta version to download (server was stalling out when I posted this), and have discovered that the metadata issue remains. Not sure what this change was intended to do, but it certainly is not what I expected! Sorry GrantCee. I am unable to help. What I do know is that the Serif team do respond to a post if it describes a reproduceable situation.. Why not try startin a new post to sprcifically address your issues? Otherwise, as a longtime Adobe user (advertising agency, newspaper publisher, printer) I am very excited about your software! Why is the flood selection tool a magic wand? It's copied from Photoshop where the tool is named Magic Wand Tool. 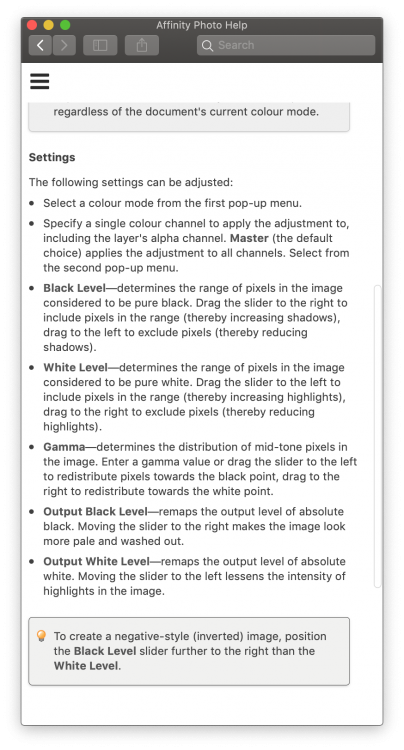 I can't get the Affinity Photo 1.7 extensions to work in Apple Photos (1.6 works.) I assume this is a known bug? Just haven't heard anyone talk about it so I wanted to check.